On the drier, inland side of the Santa Cruz Mountains in south San Jose are a collection of county parks offering boating, fishing, hiking and picnicking recreation for the urban residents of the South Bay. 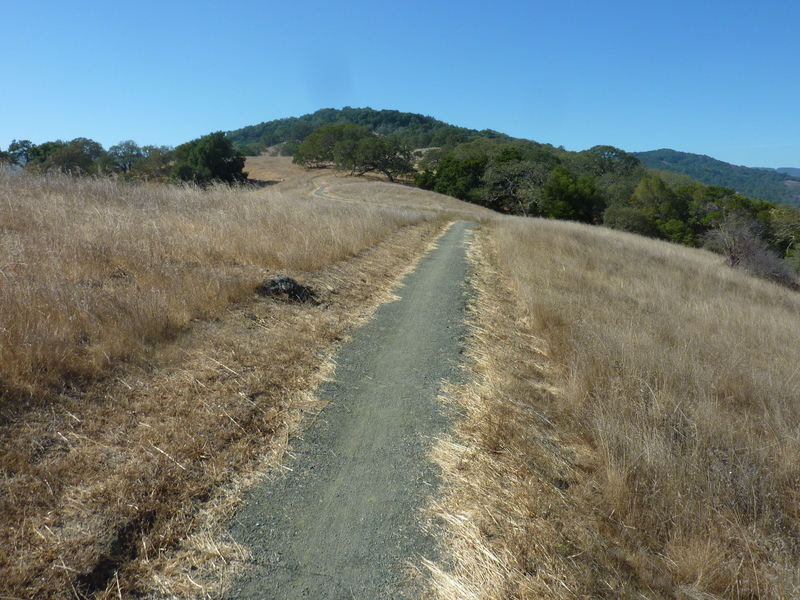 Adjacent to Calero County Park is the Rancho Canada del Oro Open Space Preserve, part of a small network of properties managed by the Open Space Authority of Santa Clara County. This government agency works in addition to the Parks and Recreation Dept of San Jose and the regional open space authority and it has been questioned in the runup to the upcoming election why this beauracracy exists at all, seemingly redundant to other government agencies with similar charters. There is a ballot measure to add another $24 per parcel in yearly property taxes to fund the activities of the Open Space Authority and expand their land acquistions. I'm conflicted on how to vote as I see land for public access as a good thing while I have a strong repugnance for more government employment. One of the highpoints of the OSP is unnamed Peak 1,784ft with something over 300ft of prominence. I picked it as a destination at the last moment when Steve asked if I might like to go on a hike. Convenient, new, and with a bushwhack summit it had some measure of adventure, too. Finding the parking lot was not overly difficult, located at the end of Casa Loma Road. Finding the trailhead we were interested in was somewhat more complicated as there are two to chose from. The obvious one is for the trails in the adjacent Calero County Park and it was to this we were first drawn. We started a few hundred feet down the road before I had second thoughts. Consulting the map was partly helpful but it, too, seemed a little confusing - not enough closeup detail to make things obvious. Eventually we walked back to the parking lot and found the smaller sign and the route to the Mayfair Ranch Trail. This leads up one of the two main ridges that comprise the OSP. The higher ridge is home to Bald Peaks which I had visited a few years earlier from a different TH in Colero County Park. Our trail climbs a few miles before dropping down to Baldy Ryan Creek and joining trails to Bald Peaks. Where it begins to level out and traverse around the northeast side of our peak we left the trail and headed up grassy slopes leading to the summit, about 1/3 mile away. At first the going is easy and most promising, but it grows thicker underfoot with poison oak to watch out for. Had there been a good deal of the stuff we'd have turned around, but the amount seemed low level and we pushed on. We had long pants and gloves as precaution but would remain somewhat nervous. We reached the summit in less than an hour, finding a few stately oaks atop along with lots of tall brush and rather poor views. I was laughing as Steve followed me to this decidedly unexciting summit. "I love you," I chuckled. He looked at me somewhat quizically but automatically responded, "I love you, too," with a smile. I commented how I really don't have many friends who would follow me into the brush like this for such dubious reasons. "Hey, it's and adventure!" he countered. Immediately west of the highpoint is an old fence marking the preserve boundary, beyond which is an open grass slope leading lower. It seemed like it might make an easier return route and we went over the fence to explore. The view north to Bald Peaks was really delightful and we decided to pause here to take an extended break. Steve had brought a couple of 22oz bottles of IPA, cold no less, and we spent the next 45min relaxing, drinking, waxing philosophically and more drinking. By the time we were ready to go (and coincidently were out of libations) we were somewhat inebriated which seemed only to add a dimension to the adventure ahead. Dropping north down the grassy slope we were only about 100ft down from the ridge when the grass gave way to brush. Not the thick, impenetrable stuff found on the south slopes around here, but the more questionable variety you can get through, but you wonder if you really should since you can't possibly keep track of all the possible options for the poison oak to get you. I let Steve lead the way which wasn't as selfish as it seems. Thirty years ago when we first met as younger lads, he was always the one emboldening Eric and I to adventure in states of inebriation, leading the charge with things like, "Oh, you've never seen a car go through a chainlink fence?" or "You have to be careful not to hit the stop sign too fast or it will snap back and break the windshield." And so he was the one to make a path through the tangle of thicket for the two of us while I used my mental GPS to keep us in the right direction to intercept the trail where I expected to find it. It was fun, but it only lasted about ten minutes. We stumbled upon an old road no longer used but still serviceable to get us back to the trail. We continued to sober up as we took in the views of the Diablo Range to the east upon the descent, eventually returning to the trail well before 3p. It was a great little outing for only a few hours' time, one that we both enjoyed immensely. I've decided to vote for the additional $24 assessment come November, btw. That OSP is quite a nice little gem. I had plans for that same peak on Saturday the 12th, but I gladly postponed when my son's troop- including parents- were invited to spend the day with the Sea Scouts on a boat trip to watch the Fleet Week air show. It's nice to find out that the brush at the summit doesn't seem to be as thick as implicated by the satellite views and my recent views from Bald Peaks.